This recording is a must for all Dyer and Chopra fans! Deepak Chopra is the international bestselling author of The Seven Spiritual Laws of Success, Creating Affluence, Quantum Healing, Perfect Health, and Ageless Body, Timeless Mind. Wayne Dyer is the international bestselling author of Your Erroneous Zones, Real Magic, You’ll See It When You Believe It, and The Power of Intention. 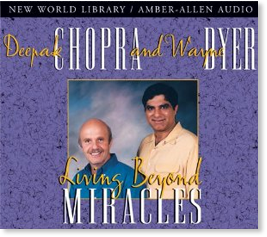 For decades, Deepak Chopra and Wayne Dyer, two of today’s most prominent names in the areas of self-development and holistic health care, have delighted audiences worldwide with their books and lectures. Now for the first time their insights are presented together in this live recording. It features individual talks by each of the speakers followed by a fascinating dialogue filled with humor, wisdom, and inspiration. Listeners will appreciate the interaction of these two great minds, as the authors question, challenge, and play off each other in the search for self-discovery.